The FTC is responding to mounting charges and evidence presented by Wall Street firms, business media, class action lawsuits and consumer and Hispanic organizations that 'Herbalife' is not a legitimate sales business but an illegal pyramid scheme. Enough evidence has already emerged to dispel the myth that 'MLM' is a modern form of 'direct selling.' Some 'MLMs' actively discourage selling. Instead, they tell the recruits to 'be their own customer' or just 'buy from yourself' and then find others to do the same. How do you make money buying from yourself? And if 'finding others to do the same' means making money from recruiting, isn't that the perfect definition of a pyramid scheme? It is indeed difficult, if not impossible, to find a single individual that actually makes a sustainable profit from just selling 'MLM' products. But 'MLM' recruiters are everywhere! As a result of painstaking research and courageous whistle-blowing the other myth about 'multi-level marketing' has also been demolished. It is that 'MLM' offers an 'income opportunity' to the average person. The data verifies that 99% never earn a profit. Factoring costs and product purchases means that more than 99% lose money in 'MLM.' This extraordinary fact had been hidden from view for decades. Now that is in the news, 'MLM' companies are changing stories to claim that few people who sign MLM sales contracts are even interested in income at all. They couldn't care less about money, 'MLM' promoters say of the enrollees. They just love the products. So, if 'MLM' is not about 'direct selling' and it offers no viable income opportunity, then what the heck is it? Two documents are presented in the current edition of Pyramid Scheme Alert's Update that address that question. 2. "What Is this Thing Called "Multi-Level Marketing?" Robert FitzPatrick, President Pyramid Scheme Alert. I urge you to read these documents to learn about the legal and the financial records that determine whether 'MLM' is the 'greatest income opportunity in the world' or the world's biggest scam; whether it is 'direct selling' or pyramid recruiting; and whether it is a 'sales network' or a financial cult. The 'Herbalife' Ministry of Truth inverts reality. The great weakness of all totalitarian, cultic groups is that, once you know how they function by deceiving their adherents into accepting a Utopian fiction as fact, the inflexible reality-inverting reactions of these groups to any challenge to their authenticity, can be predicted with almost 100% accuracy. Thus, the latest, predictable move by the 'Herbalife' Ministry of Truth, is the creation of a kitsch, new Website which serves up a veritable feast of reality-inverting Utopian 'MLM' propaganda; all of which has been designed to obstruct justice in order to continue to commit fraud. Doug Wead & Patrick Buisson - blackmailers of Presidents, Bush and Sarkozy? I've recently been asked if I believe that senior agents of the US Federal Trade Commission will do their job and pursue a thorough investigation of 'Herbalife,' when, for years, the FTC has been protecting 'MLM income opportunity' fraud? - just how deeply, and easily, traditional culture has been infiltrated by the absurd, but nonetheless pernicious, 'MLM income opportunity' fairy story. - just how easy it is to deceive and manipulate persons who are certain that they cannot possibly be deceived and manipulated. Over the years, Doug Wead has made millions of dollars by steadfastly pretending to be a wealthy, 'Multi-Level Marketing expert' and 'Compassionate Christian' philanthropist who has a secret knowledge which can enable ordinary poor humans to transform into wealthy superhumans (just like him), and that he is prepared to share this secret knowledge with anyone (for a price). 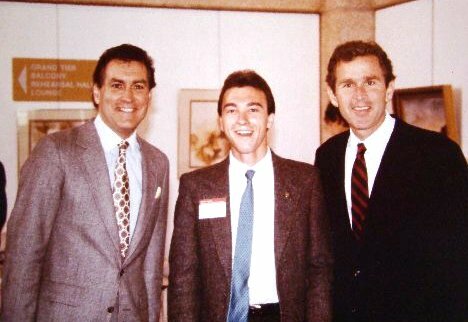 At this time, Doug Wead, worked alongside George W. Bush. 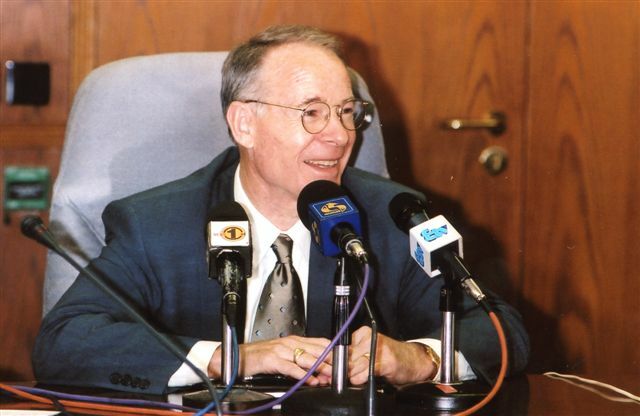 In the late 1990s, Wead was consulted (in the capacity of 'spiritual advisor') by George W. Bush, when he was still Governor of Texas, but planning to stand as Presidential candidate. Wead then abused his position of trust and secretly tape-recorded his private conversations with George W. Bush. 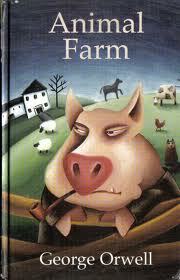 In 2005, a few tantalising extracts were released by Wead to the New York Times. In these, Bush began to make indirect confessions about his private life; particularly, his previous abuse of alcohol and narcotics. Bush also spoke of his non-conservative attitude towards homosexuality. At the time, certain commentators speculated that these extracts were released as a warning to George W. Bush and the Republican party, and that Wead probably held much more damaging material in reserve. Perhaps it's all just an unfortunate coincidence?, but prior to these sinister events, in 2001, newly-elected President George W. Bush had appointed one of the 'Amway' mob's own attorneys, Timothy Muris, as Chairman of the Federal Trade Commission. Muris then just happened to appoint David Scheffman as the FTC's new Chief Economist (a post which Scheffman had previously held 1985-1988). Despite Scheffman's jargon-laced lies, the FTC eventually succeeded in closing the 'Equinox' racket and recovering $50 millions for victims, but prosecutors had estimated that at least $330 millions had been taken from the public. Amazingly, Scheffman, a de facto agent of criminals, remained hiding in plain sight at the FTC's Bureau of Economics for two years, 2001-2003, during which time, Orwellian modifications were made to the federal government's policy towards pyramid schemes dressed up as 'MLM/Direct selling income opportunities.' In short, the FTC steadfastly pretended to be protecting America's consumers, whilst a number of its senior agents began to protect 'MLM' racketeers to the detriment of the public. 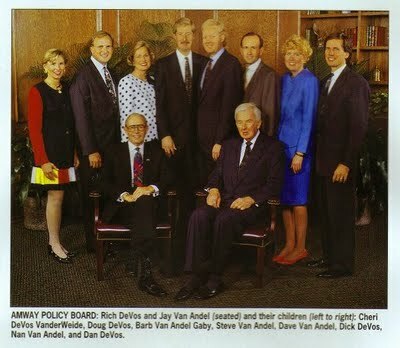 Doug Wead's own connections with the 'Amway' mob, and particularly with Dexter Yager, go back many years. However, in 2007, Doug Wead and Dexter Yager's long-time criminal associate, Jean or John Godzich, was convicted and sentenced in France to a three year prison term (in absentia) for stealing 6 millions Euros from his bankrupt French 'MLM' front company, 'Le Groupement.' An international arrest warrant for Godzich (a former 'Amway Diamond Distributor'), has never been enforced, because the USA doesn't permit the extradition of its citizens. Patrick Buisson, the man who shook the French right. As far as I know, Patrick Buisson has never been involved in any 'MLM' cult, but he has lately been exposed as a (failed) blackmailer of former French President, Nicolas Sarkozy whom he once approached, and befriended, in the role of 'historian, author and political adviser,' but who is now described as a cult-style guru and skilled mental manipulator. Indeed, the similarities between Patrick Buisson and Doug Wead, are quite astonishing. Whilst somewhat ironically, the French word 'buisson' means a small bush. Via his attorney, Patrick Buisson first insisted that no secret tape recordings of the President existed. He then claimed to have recorded his conversations with Nicolas Sarkozy accidentally. 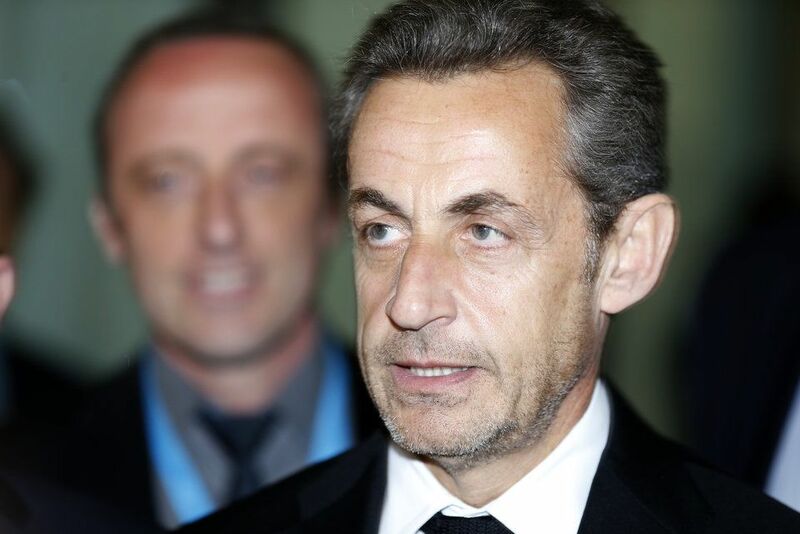 Most-recently, only when faced with a lawsuit filed by Nicolas Sarkozy and his wife, Buisson has begun pretending that his private recordings were stolen, and that he had no part in releasing any of them to the press. One thing is certain, with a few notable exceptions, almost everyone who has come into contact with Patrick Buisson, is now terrified to say anything. Accurate questions reveal the full-truth about 'Herbalife (HLF)' and 'Multi-Level Marketing (MLM)'. In the past, various casual observers have thrown up their hands in horror when I have dared to say that, given its duration, scale and devastating impact on huge numbers of vulnerable persons, blame-the-victim 'MLM Income Opportunity/Prosperity Gospel' cultic racketeering is an ongoing financial, and psychological, holocaust (with a small 'h') of which many people have been in denial. Sadly, the essentially-absurd fairy story entitled 'MLM' has been allowed to expand to such titanic proportions, that the truth has long-since become almost unthinkable. 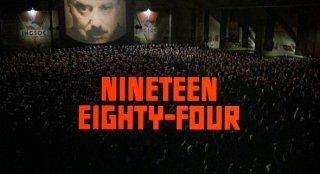 However, since the concept of the big propaganda lie, is widely-understood, it seems almost inconceivable that the directors of law enforcement, and intelligence, agencies around the world have also remained unable to look beyond the ends of their noses and identify what the bosses of 'MLM/Prosperity Gospel' cults have actually been doing. 'Amway' a.k.a. 'Quixtar,' is the original, blame-the-victim 'MLM Income Opportunity' racket, but 'Amway' itself, is only part of the wider-phenomenon of pernicious cultism. Today, Steve VanAndel and Doug DeVos, front the 'Amway/MLM' racket . By steadfastly pretending to be compassionate Christian capitalists, and by infiltrating traditional culture and discrediting, and/or intimidating, and/or paying-off, the few destitute, but determined, victims who have come forward, the billionaire bosses of the 'Amway' mob have been allowed to maintain a monopoly of information and continue to poison the minds of millions of vulnerable people around the world. Registered in the Cayman Islands, based in California and capitalized on Wall St., 'Herbalife' has been the corporate front for a blame-the-victim 'MLM income Opportunity' cultic racket. Not surprisingly, the profitable 'Amway' racket has spawned countless, profitable copy-cats. Former 'Amway' double-agent, Ian Howarth. Former 'Amway' double-agent, Graham Baldwin. In 1994, when faced with partial exposure in the London listings magazine, 'Time Out,' the billionaire bosses of the 'Amway' mob easily bought the services of two self-styled 'cult advisors' in the UK, Ian Howarth ('Cult Information Centre') and Graham Baldwin ('Catalyst'). Readers should also be aware that Mr. Baldwin is a particularly absurd character, who (for years) has got away with steadfastly pretending to be a former Army Intelligence officer. Following the 'Time Out' article, a significant trickle of desitute, but confused, 'Amway' victims were beginning to come forward in Britain. Not surprisingly, the 'Amway' bosses were keen to maintain their monopoly of information in order to prevent a criminal investigation and isolate themselves from liability. Subsequently, all persons approaching Messrs. Baldwin and Howarth with complaints, and enquiries, about 'Amway' (imagining that they were consulting independent experts) were told that although certain 'Amway Networks' had been accused (in the past) of operating like cults (by ill-informed journalists), the company itself was not a cult. Between 1994 and 2007, escorted by the affinity-pretending 'Amway' double-agents, Messrs. Baldwin and Howarth, numerous dissatisfied former 'Amway' adherents continued to be taken back to the organization where they were shown finely-printed clauses in their take-it or-leave it 'Distributor' contracts which appeared to oblige them to remain silent and pursue 'Amway's' own internal system of dispute resolution. It's difficult to know exactly how many British 'Amway' victims were kept away from regulators, legislators, law enforcement agents and journalists using these classic, 'Scientology'-style, subversive tactics. Due to the absence of victims, UK trade regulators did not launch a civil investigation of 'Amway UK Ltd.' until 2007. By that time, around one million UK and Irish citizens had been churned through the 'Amway' racket and an estimated $ one billion of effectively-valueless publications, recordings and tickets to meetings had been peddled on the pretext that these 'optional business building materials' contained exclusive secrets for achieving success in 'MLM.' None of the largely-cash-based receipts from the related-advanced-fee fraud were channelled through 'Amway UK Ltd.,' which itself never once declared a net-trading-profit in more than 30 years. Furthermore, during the same period, exactly the same system of inter-related frauds was being operated behind 'Amway's' mystifying corporate labyrinth all over the world. To date, Messrs. Baldwin and Howarth have never been fully-investigated (let alone held to account), but there is absolutely no doubt that they were duped into participating in an international conspiracy to commit fraud and obstruct justice. Indeed, when the wider-picture is examined, Messrs. Baldwin and Howarth's key-role in hiding the results of the (US-based) unlawful 'Amway' enterprise in Britain, clearly forms part of an overall pattern of ongoing, major racketeering activity (as defined by he US federal Racketeer Influenced and Corrupt Organizations Act, 1970). Rather than heading UK-registered charities, these two self-righteous crooks should probably be in prison. In the late 1990s, I supplied UK trade regulators with completed questionaires from a few destitute former British 'Amway' adherents whom I had managed to track down via another (genuinely-independent) UK cult advice association, 'Family Action Information and Resource' (now known as the 'Family Survival Trust'), but 10 years later (when the UK government finally began to investigate 'Amway') these important testimonies had mysteriously been forgotten. Currently, the phenomenon of blame-the victim 'MLM Income Opportunity' cultic racketeering has, yet again, begun to find its way into the mainstream media. This time, because of the involvement of well-informed Wall St. investors who have challenged the legality of the 'Amway' copy-cats known as 'Herbalife' and 'NuSkin.' For many years, the officers of both these corporate structures have steadfastly pretended that their revenue has derived entirely-lawfully from billions of dollars of sales (based on value and demand) conducted by networks of non-salaried direct sales agents known as 'Distributors' or 'Independent Business Owners'. However, on the dubious foundation of this unoriginal encrypted 'commercial' fairy story, the reality-inverting cultic racketeers behind 'Herbalife' and 'NuSkin,' have taken their crimes well-beyond those of the DeVos and VanAndel clans. why 'Herbalife' is an effectively-valueless corporate structure. the extent to which the blame-the-victim frauds lurking behind 'Herbalife,' have been causing significant damage to vulnerable people. 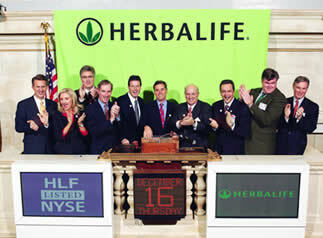 why 'Herbalife' should never have been allowed to have been capitalized on Wall St. In December 2012, Bill Ackman hoisted battle ensigns; making his analysis, and his short position, public. At the same time, he bravely called for 'Herbalife' to be investigated and closed-down as soon as possible, in the interests of the public. Predictably, the bosses of the 'Herbalife' mob reacted by inverting reality; attacking rather than defending. For decades, 'MLM income opportunity' racketeers have been lying to, and withholding key-information from, the entire world, to make money and obstruct justice. They have also been using many millions of stolen dollars to subvert the legislative process of dozens of democracies. Amazingly, as a percentage of their financial turn-over, 'MLM' racketeers have even outspent leading members of the tobacco, and arms, lobby. Yet, all of a sudden, Bill Ackman found himself being accused of lying to make money and of influence-buying in Washington. people will believe a big lie sooner than a little one and if you repeat it frequently enough people will sooner or later believe it. After more than 12 months of wild fluctuations in the market price of effectively-valueless 'Herbalife' shares, last week, it was announced that the company is finally to be investigated by the Federal Trade Commission. 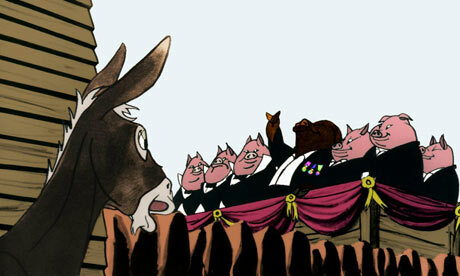 Although (to date) most mainstream journalists have refused to look beyond the ends of their noses, and reported 'Herbalife' as a purely financial story, what is actually at stake here is whether America is a grown-up democracy governed by the rule of law, or a sleazy de facto kleptocracy ruled by an axis of billionaire 'MLM Income Opportunity' racketeers, their amoral attorneys (many of whom have been former regulators), accountants, bankers, co-opted academics and corrupt, and/or stupid, politicians. As if to prove the validity of Bill Ackman's analysis, the 'Herbalife' racketeers and their criminal associates have recently rewritten their fairy story in a transparent attempt to convince regulators that they have not been telling lies. 'Herbalife distributes and sells its products through a network of independent members, or Members, using the direct selling channel. 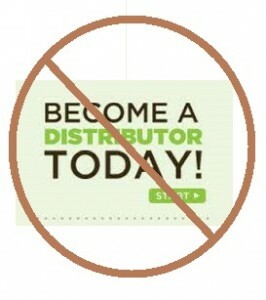 We are in the process of changing our terminology to identify “distributors” as “Members.” Those Members who participate in the business opportunity that our network marketing program presents are referred as “sales leaders.” As of December 31, 2013, we sold our products in 91 countries to and through a network of approximately 3.7 million independent Members. 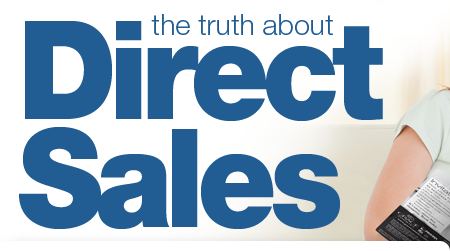 Most of our Members are discount customers, however as of December 31, 2013, 672,000 achieved sales leaders status. The latest modification to the thought-stopping encrypted-language in which the 'Herbalife' fairy story has been presented, conforms perfectly to my overall analysis of how blame-the-victim 'MLM income opportunity' culic racketeering has functioned; for if any crook sets up a self-perpetuating money circulation game by persuading prospective players to hand over $200 per month and to recruit 6 more $200 per month players, who each can recruit 6 more $200 per month players, etc. ad infinitum, on the pretext that all players who obey the mathematical rules of the game can eventually build a constantly-expanding network of recruits/recruiters and receive an unlimited residual income comprising monthly commission on the $1200 monthly payments of their recruits/recruiters and on the $7200 monthly payments of the recruits/recruiters of their recruits/recruiters, etc. ad infinitum, then it is immediately obvious, that such a game is based on the crackpot pseudo-economic theory of infinite geometric expansion, or endless-chain recruitment, and is, therefore, a fraud. However, once you understand the above, it doesn't take a genius to work out that, if a narcissistic crook wants to dissimulate exactly the same fraud, all he/she needs to do is launder the unlawful payments by telling casual observers that his/her endless chain of losing players were 'customers' and by giving his/her endless chain of losing-players some cheaply-procured commodity, and/or service, in exchange for their money, and then telling casual observers that all these unlawful transactions (made on the false expectation of future reward) were really lawful 'sales' (based on value and demand). In other words, the products, and/or services, are just distracting wampum which might as well not exist. Amazingly, two US academics (who have previously acted as specialist economic advisors on pyramid schemes, to the FTC), William Keep and Peter Vander Nat, have almost arrived at the same common-sense conclusion in a forthcoming article, 'Multilevel Marketing and Pyramid Schemes in the United States: An Historical Analysis,' to be published in 'The Journal of Historical Research in Marketing.' That said, this article is fundamentally-flawed, because in private, William Keep has freely-admitted to me that there has been a cultic aspect to 'MLM' which he, and his co-author, were obliged to ignore, because this is not their field of expertise. In simple terms, in respect of 'Herbalife,' most researchers have been hunting for bear, but they have only been loaded for rabbit. Indeed, evidence of the above hybrid-variation of a sustainable pyramid fraud dissimulated behind effectively-unsaleable products, and/or services, is what agents of the FTC are finally going to hunt for at 'Herbalife', but unfortunately, it is not quite as simple as that, because, the instigators of the 'Herbalife' racket (like those of the 'Amway' racket whom they have copied) have been inflicting impermissible, co-ordinated, devious techniques of social, psychological and physical persuasion on their victims in order to shut-down their critical, and evaluative, faculties and prevent them complaining. In other words, since current 'Herbalife' adherents have been dissociated from external reality, their testimonies can be predicted with almost total accuracy, because they have unconsciously accepted the fictitious (but nonetheless emotionally and intellectually overwhelming) 'MLM Income Opportunity' controlling scenario, as fact. Once this is understood, what has actually been occurring, can only be determined by asking past and present 'Herbalife' adherents the right questions written in thought-provoking, accurate, deconstructed language. 'MLM' racketeers apparently still believe that all casual observers (including regulators, legal and economic advisors, law enforcement agents, legislators, journalists, Wall St. researchers and judges), will not be able to look beyond the ends of their noses. 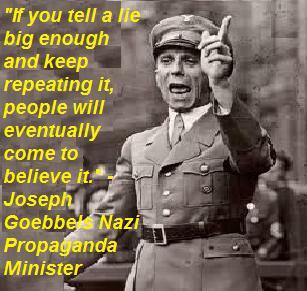 Consequently, America's home-grown axis of evil remains certain that the full-truth will never be uncovered. 9. At the time you signed up, what did you believe to be the success-rate of persons participating in 'MLM' schemes (i.e. about what percentage of participants did you think made an overall net-income out of 'MLM')? that you should regularly buy tickets to, and attend, meetings conducted by 'positive winners' at which you took part in rythmic chanting and moving?